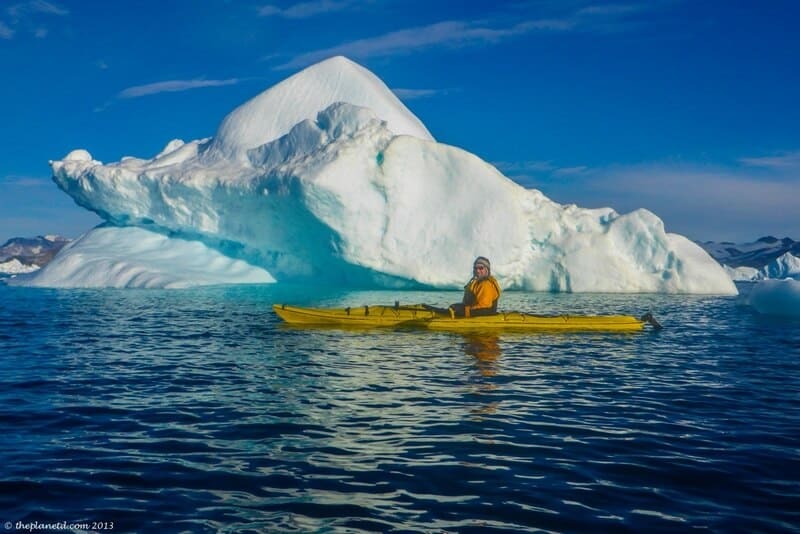 If you are going to kayak anywhere in the world, I would put kayaking in Greenland at the top of your list. 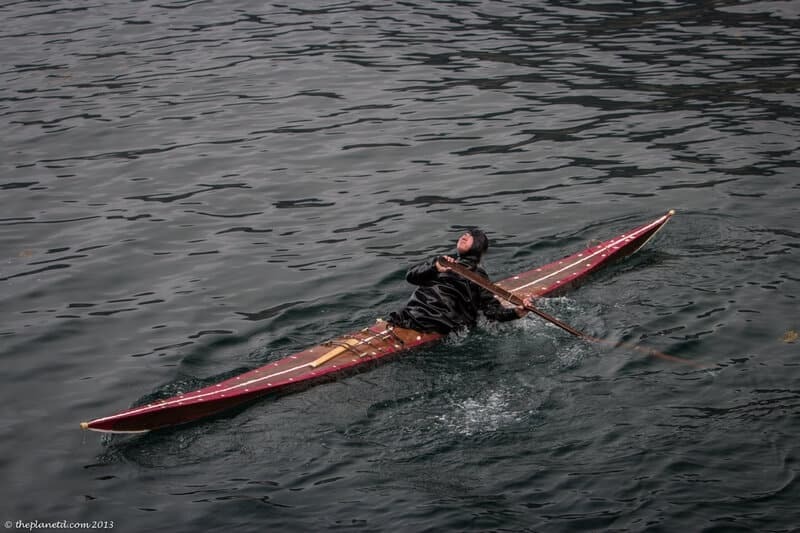 Kayaking holds a strong tradition in Greenland. It was invented by the Inuit of the Arctic for travel and hunting. Today locals still hunt for their food by Kayak. Species like the Narwhal whale can only be legally hunted by using a kayak and the brave and skilled hunters head out to the open water to bring home food and much needed Vitamin-C for the entire village to make it through the winter. Whale and seal are their main source of Vitamin C.
Kayaking in Greenland isn't just a fun sport, it is important for survival. 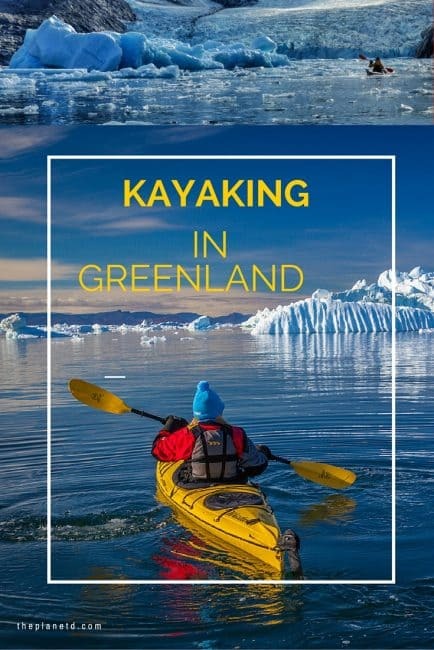 People learn at a very young age how to kayak in Greenland and they even compete in serious competitions showcasing all the different rolls they have mastered. There is a reason for each roll not only for self-rescue, but for spearing fish while in the water, upside down and all around. Hunters need to know how to brace to catch their prey and get themselves out of a sticky situation. 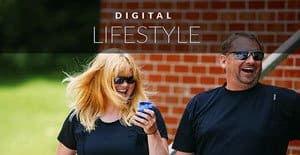 While we don't have to rely on kayaking to survive, we definitely love kayaking and have learned a few skills during our travels around the world that have allowed us to kayak on all seven continents. 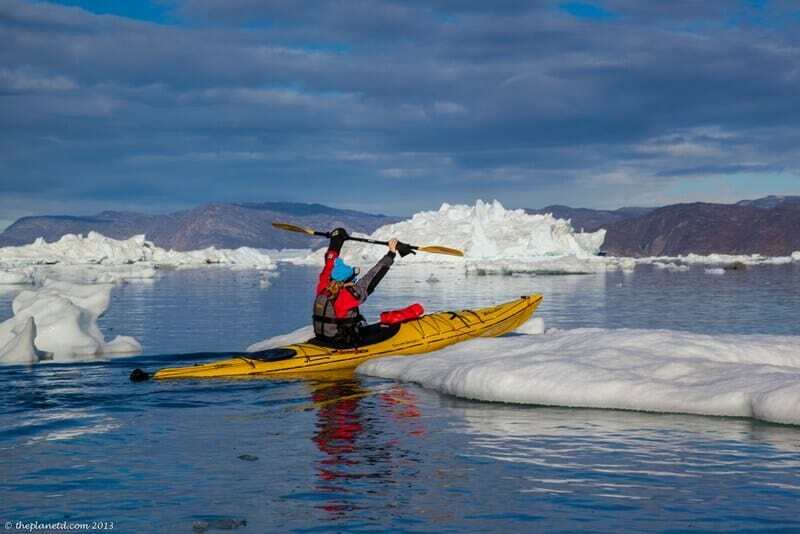 When we were on our Arctic Expedition with Quark Expeditions, we had the opportunity to go Kayaking in Greenland and it was the best part of every day. Whenever the seas were calm and the sun was shining, we were out on our boats exploring uncharted Fjords, glacier bays, and even old abandoned shipwrecks. 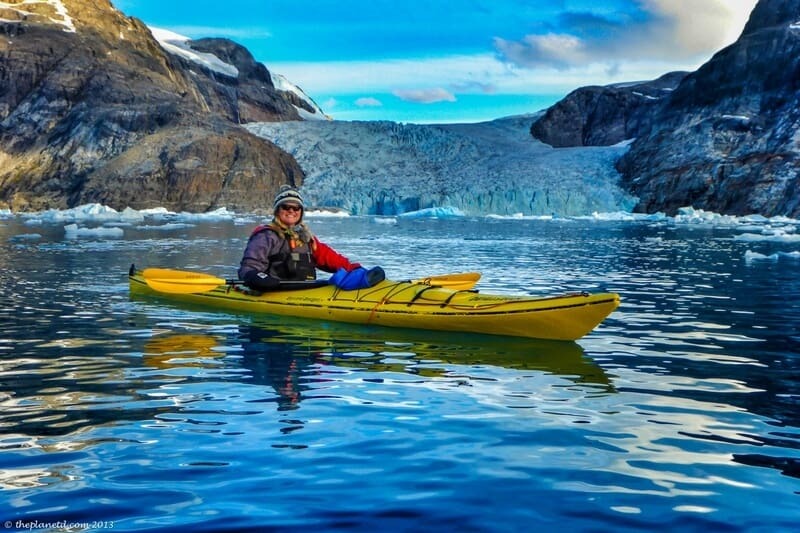 Kayaking in the polar regions is one of the best adventures you could ever do in your travels. 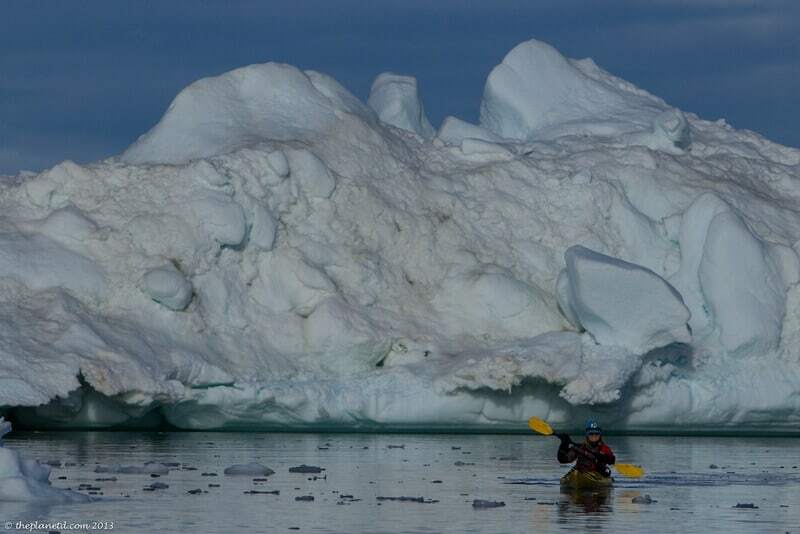 It's a thrill to get into a kayak and paddle through icy waters and brash ice. It's a silent way to explore nature and to get up close and personal to great hunks of ice floating out to sea. Note: Before kayaking in Greenland, it is recommended to learn how to do the wet exit in case you flip in cold water. If you can learn the roll and T-rescue, even better! 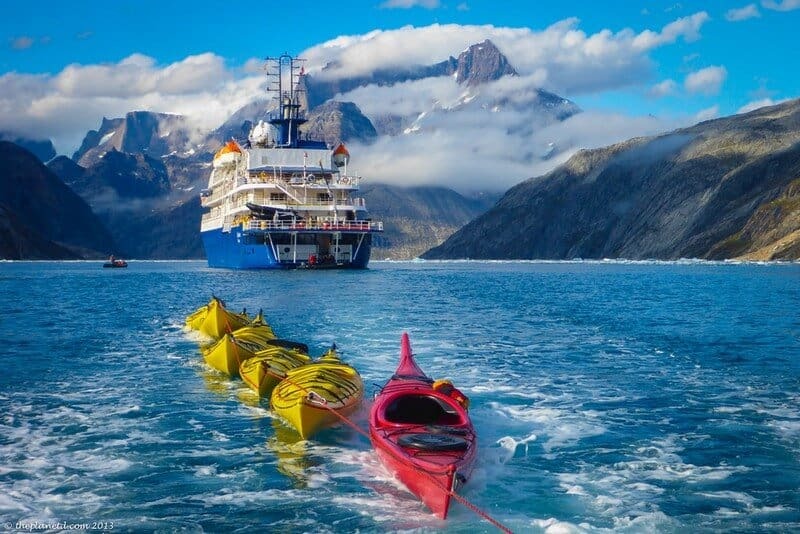 There is a protocol when it comes to kayaking in Greenland. 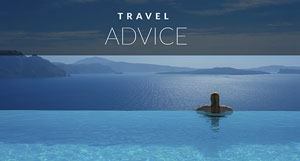 You must stay a safe distance from both icebergs and glaciers. An iceberg can roll at any time and as we all know by now, you only see the tip of the iceberg above the water. The majority of it is underneath the surface and if you are too close, you will be scooped up and swept underneath. We always stayed at least three lengths away from the height of the iceberg. 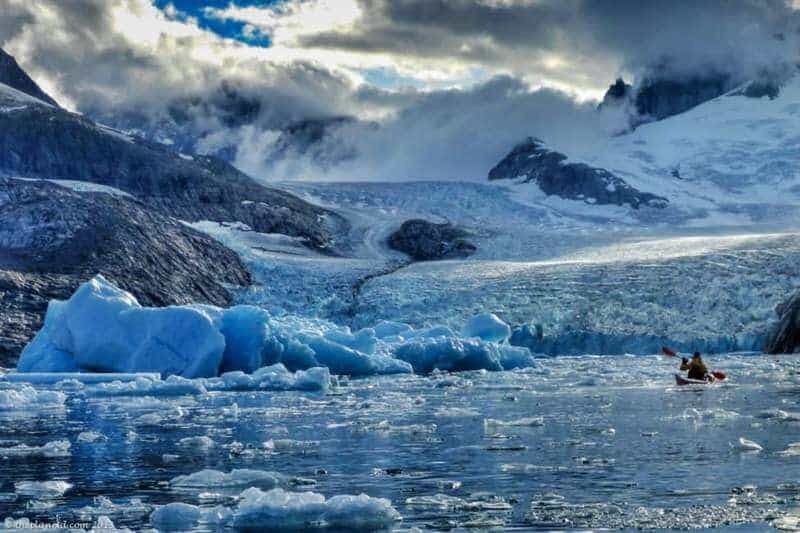 Calving glaciers can be just as deadly. If giant chunks of ice fall into the sea, it creates huge waves that can cause a catastrophe. Even when you are walking along the shore, you must keep a safe distance from the water in case an unexpected swell comes your way. 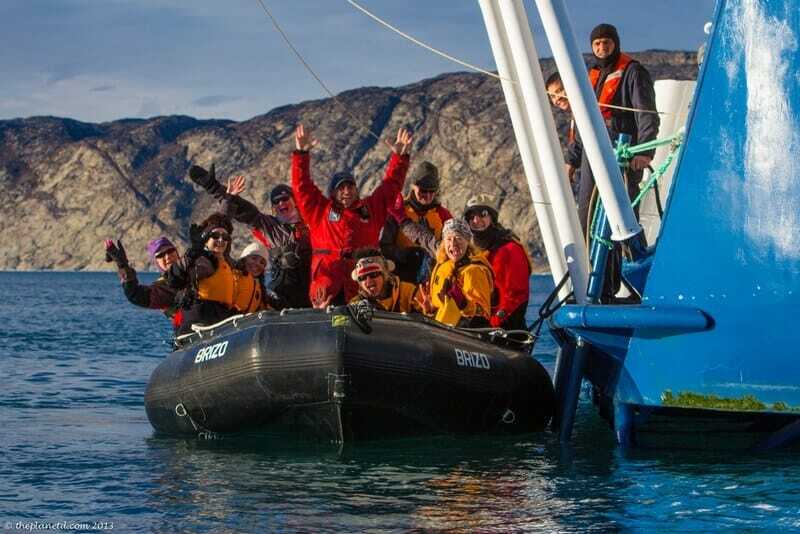 But when kayaking with Quark Expeditions, you don't really have to think or worry about any of that. You have skilled guides leading the way. Their extensive knowledge of ice allows them to read the situation where they can take safely around the massive bays to explore the ice and coast. You are given a dry suit, booties, pfds, and pokes (neoprean mittens to keep your hands warm) and all you have to bring with you is your warm hats and base layers. Each landing you are whisked off the ship in a zodiac to the location you are going to explore each day and your kayaks are towed behind. 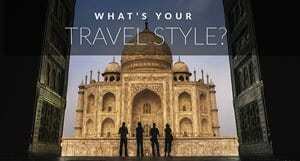 You are far away from the other passengers on the ship and are kept in a quiet location that feels all to yourself. Even if you don't feel comfortable, you can kayak in a double kayak with your spouse or your friend. Double kayaks are more stable and you have the extra power of two people kayaking. It is the most magical way to explore a coast. 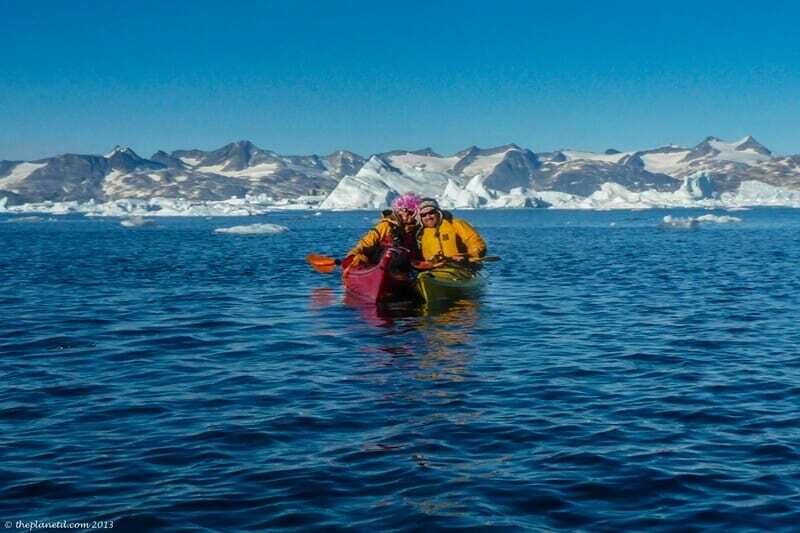 Dave and I love to kayak wherever we go and if you happen to go to Greenland or the Arctic, make sure you try kayaking. 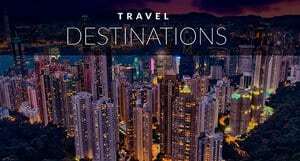 It's not only the adventure of a lifetime, but it's also something worth bragging about. 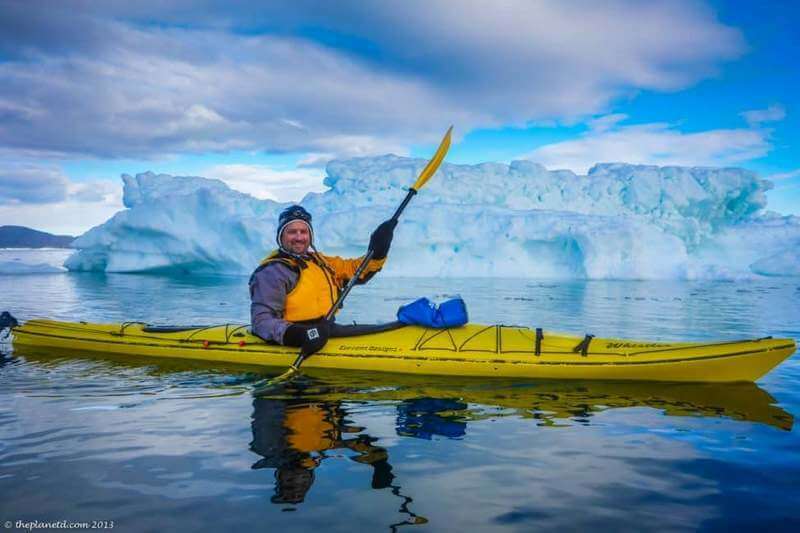 9 Responses to "Kayaking in Greenland – The Greatest Arctic Adventure in Photos"
Oh my goodness. The pictures are stunning. 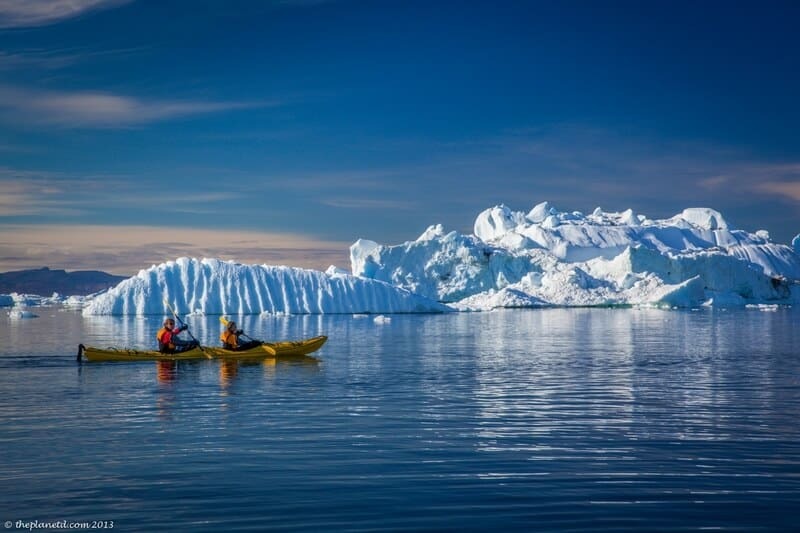 I have always had this in my wish list that I would go kayaking in Greenland. I would love to have this arctic adventure. I hope you had fun. I am an avid kayaker, and I hope to do next year. Our beautiful that is wonderful this place parabens !! Have only kayaked in warm environments , definitely would love to do something like this. Any extra measures to stay warm if you fall in? ?